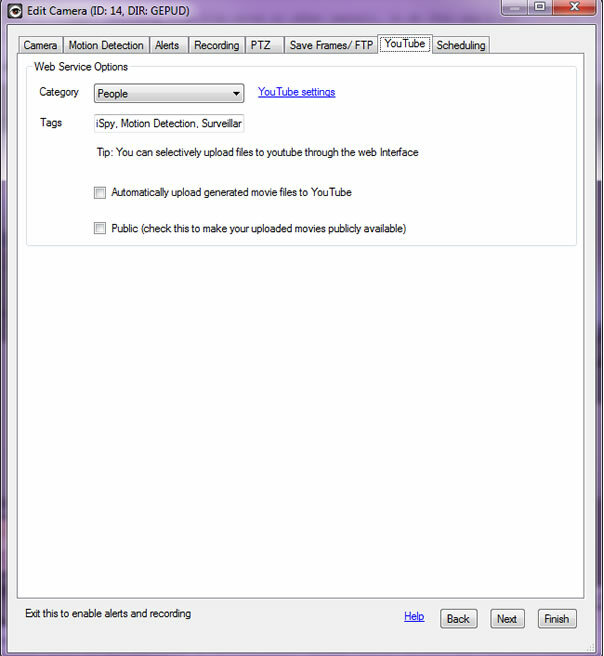 iSpy can upload your captured and converted movies to YouTube. You will need to add your YouTube account name, username and password into iSpy Settings first. You can also upload to YouTube on demand through iSpyConnect (for when you capture something worth sharing). To do this, play the video in iSpyConnect and use the links to upload as a private or public video. You can also email the video to people using the same controls (they are sent a link to the uploaded movie). Category: Specify the category to list your movies under. Tags: Specify any tags for your movies - examples: "Ghosts", "UFOs", "Birds" etc. Public: You can uncheck this to make your uploaded movies private (only visible to you).